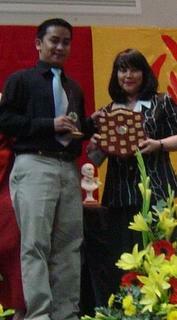 Christian Vargas came first in the state in Filipino Language studies. I think it's particularly cool because dad was appointed Chairman of the syllabus committee after he lobbied for it to be included as a HSC language a while ago. So it's great to know that there are still students of Philippine background still taking an interest in the language. Of course none of these things happen without teachers like Heidi Portugal who put the language on the map in the actual school. Christian's pictured with Josie receiving the Perpetual Diaz Trophy.